Mom of Many Words: Are we anywhere near there yet? There, now you are all (more like both) caught up. 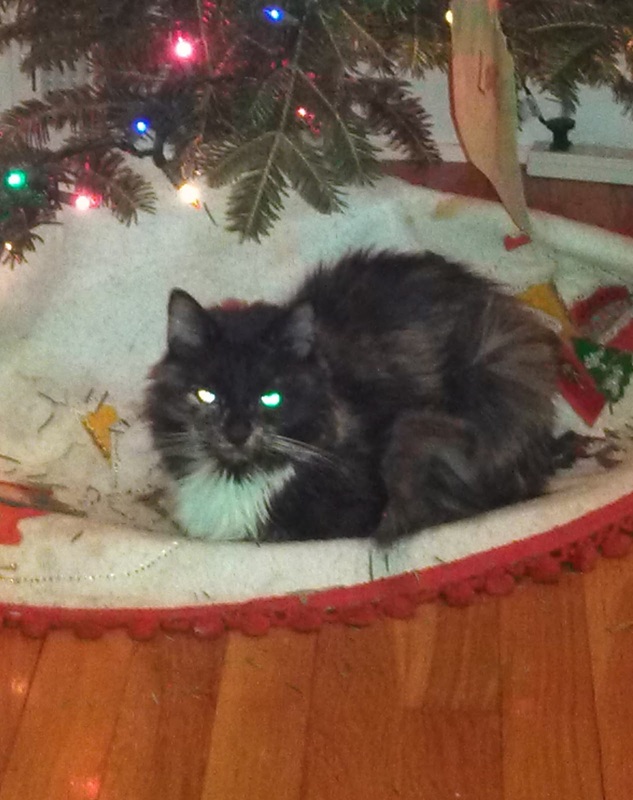 The first part of this blog is a tribute to a member of our family that we recently lost – our cat Reeses. She came to us through an animal shelter 13 years ago as a tiny ten-week-old ball of tortoiseshell fur. She looked like peanut butter and chocolate rolled together. Reeses was to be OK’s cat. However, being a true “scaredy cat,” she wasn’t much for being held by a then 11-year-old. Eventually she chose S as her target. Person, I mean. He moved slower than OK and sat for extended periods of time watching cartoons. Harmless enough. She claimed her stake in between our pillows at the start of each night, but eventually would persuade (harass) S into letting her slip under the covers and sleep on his arm. Occasionally that meant he would wake up to claw marks in his head if he moved too much, or – heaven forbid – sneeze. Reeses was terrified of her own shadow and begrudgingly tolerant of the other pets in the house. She made a habit of taunting us during meals as she sat atop the opening between the kitchen and living room, yanking her fur out while we ate, until one of us (usually me) would get so tired of watching her grow a beard that we (I) would get up, de-fur her yap and (gently, for fear of retribution) remove her from her post. We had to say goodbye to her only a few days before going on the road. I think maybe that was a blessing, to be distracted and not home to ‘see’ her in her usual haunts. We love her and we miss her. Sleep well on the arm of an unsuspecting angel, Reeses. And away we go. And stop. And go. Road trips. We’ve had more than our share of them this past year, what with visiting 15 colleges in YK’s pursuit of the perfect higher education setting, and seeing family. Pennsylvania will now be a semi-regular stop on our travel agenda since that is where YK will be for the next four years, and since OK hopped on a bus bound for Philadelphia (and her now fiancé) a year and a half ago. She is thriving in the city life. I have no idea where this child came from. Road trips usually mean stories. Let’s start out with Pennsylvania. That is, let’s start out with our trip through Maine, New Hampshire, Massachusetts, Connecticut, New York and Pennsylvania. And back. The purpose of this trip was YK’s second visit to a college where she had been accepted, for a weekend of events. The trip started out simple enough. We got on the road at a reasonable hour that Friday morning (i.e., before I had to threaten anyone), and it looked like there would be no issue with getting to the area within an hour of registration for that afternoon’s festivities. Plenty of time to stop at the hotel first and freshen up. Plenty of time. Sometime around 3 p.m. we were cruising down I-84, when a thick gust of smoke smacked the windshield shortly after entering the state of Pennsylvania. Just to verify, the very observant teenage backseat driver announced, ‘Mom – smoke.” We pulled off to the side of the highway and S attempted to diagnose the problem. Trucks flew by at a pace that practically spun us around as we tried to hold our ground on a jagged slope while S stood staring at the car’s innards and YK and I just stood. We decided to try and limp to the next exit about a mile away. As luck would have it, an employee at the quickie mart we pulled into was nice enough to come over and see if we needed any help. Let’s see… smoke pouring out of the hood, man on phone with a mechanic several states away, woman on phone telling someone they will be “late – I have no idea how late”, pacing teen. I would say yes. He then directed us to his mechanic right next door. I did have a momentary flashback to an I Love Lucy episode and was almost tempted to ask if the mechanic was also the mayor, fire chief and justice of the peace. It passed. While S hovered around the garage waiting for the mechanic to diagnose the issue, YK and I relaxed – as much as we could with an impending deadline to reach our destination – in what had to be the most welcoming waiting room a mechanic has ever had. It was equipped with a television, sofa and comfortable chairs, and there was another room with a pool table. The office manager was the mechanic’s girlfriend and explained to us that she made clear her conditions for working there. Obviously, these conditions were met, and the many spouses/partners/children who might be subject to “the wait” would forever be appreciative. End result: the transmission had decided to call it a day. I will say that the people who worked with us really went out of their way to try and get us back on the road, but it was not meant to be with this car. My Baby. My radio-tuner-on-the-steering-wheel, special-sunglass-holder, first-sunroof-in-20-years Baby. Does this thing take AA batteries? We rented a car for the remainder of the trip. Wait, that’s not really accurate. We rented a Toyota Yaris. It was seriously the only car available, and we were lucky (using the term loosely) we even got that, since we called after hours and just happened to get a wonderful employee who waited for us. That was where “seriously” ended. You know those cars you see in the circus that look like they barely fit 2 people in, and then 20 clowns get out? I do believe we could’ve rented the red noses and big shoes for a little extra. After cramming the three of us and all our gear (including a sleeping bag, since YK would be spending the night on the floor of a dorm) into said… car… we hit the road for what was to be another almost 3 hours. Full-bore. I’m not kidding – I was driving, and nobody dared to ask how fast we were going, let alone if the wheels ever hit the ground. I’m not saying I was speeding. I was just… navigating with a goal. Got there in 2 hours and 20 minutes. Goal! We made it after all programs had ended except for dinner, which was already in progress when we arrived. So much for freshening up. We dragged our scruffy selves into the dining hall, our ‘good’ clothes now balled up in the back seat of the clown car. Nobody cared, they were just glad we made it at all. Wiped out from the trip, we settled down for the meal and what was left of the evening’s presentations. To our surprise – and YK’s glee – she ‘won’ a prize for the fact that it took us “twelve hours and two cars” to get there. That made it all worth it, to have a shiny new mug with the school name (fortunately, the school she has chosen to attend) emblazoned on it! Definitely a comparative value to a transmission. Sigh. It wasn’t until the next day when we realized we were driving around in something Mattel might have designed, as we parked at our hotel after Saturday’s events at the college. Just as S was about to get out, he uttered, “Oh My God.” It might have been a prayer that we had thus far managed to not be tossed off the road by a strong wind, but YK and I both jumped on it. He managed to blurt out, “One windshield wiper.” That was all it needed. And that was all it took for us to pretty much lose it. I did give the steering wheel a little pat between snickers, more out of pity than admiration. Thankfully, the car couldn’t tell the difference, and delivered us home scrunched but safe the next day. Back in Maine we traded that car in for a real car – a Chevy Malibu with all the jazzy little features cars come with now. This required a lesson in how to turn on the lights and wipers (back to a car with two of them now) without ejecting anyone before we left the parking lot. We rode around in comfort for two more weeks. Baby vacationed without us in PA for two weeks. Renting a car for such a long period sort of felt like we were the Kardashians (only a small percentage of the two people who read this blog would get a “Rockefeller” reference), minus the burden of all that money. Oh yes, it’s always fun until somebody gets the bill. We did go back to Pennsylvania the following weekend in the hopes of picking up Baby, but that was not to be. In the meantime we had a wonderful visit with OK and The Boy (a little nickname her fiancé has been honored (stuck) with since the beginning of their dating life). We also got to spend time with more family in New Jersey and Connecticut before heading home. I only have this to say about the directions I printed off from Google Maps, and the GPS agreed with. Somewhere in California someone in an office with a whole wall of plate glass is drinking skim milk lattes and choosing your route. It’s not the easiest route and it’s not the safest. It just looks interesting when they plug in all the parameters, line their Tonka trucks up along the built-to-scale construction site that is known as The Bronx, and seek revenge for the hours they spend on whatever freeway they creep along on their way to the Mountain View, California office. We live in Maine. We sweat when we spot the bridge into New Hampshire and tighten our seatbelts as we enter the Land of Don’t-Even-Think-About-Using-the-Passing-Lane, aka Massachusetts. Driving into New York construction – not a thing we endeavor to do with our own car. Even with a rental that, for all we knew of its magical powers, would uncover spikes on the tires if it felt surrounded, it was still Beyond Not Fun. After what seemed like an eternity, S took a day off from work to make the drive to PA to retrieve our car – to the tune of $3,000 and then some. At the same time Baby was going through transmission transformation, our second car needed some work done. Always worry when the term “some work” comes into play. When it rains, it monsoons. Tack on almost another $1,000 and you are close to what those two weeks cost in dollars. Time is another whole area we can’t even begin to calculate. Within minutes of seeing Baby’s return to our driveway, I was hugging the steering wheel. It was like having a child come home. No, really – think about it. The only events revolving around kids that cost us $3,000 in one week were birth and college tuition. Baby is now right up there. We remain home safe and sound until June, when college orientation begins. Until then, if you happen to rent a car that only requires one windshield wiper, you may want to check and see if it really comes equipped with an air bag – or just a cotton ball.